Adolescence is a difficult developmental period for parents and teenagers alike and the one that sends many parents searching for information or psychological help. Although there are certainly numerous books available on parenting, the majority of them are focused on younger children, and the literature concerning adolescents focuses on normal or problematic teen behavior. The Parent Effect: How Parenting Style Impacts Adolescent Behavior and Personality Development, by Joanne E. Carlson, MSW, is different in that it identifies parenting styles on the basis of the parent’s underlying issues, motivations, and behaviors and explores how these child rearing practices affect the parent-teen relationship, the adolescent’s behavior, and their long-term personality development. Parenting styles are identified and defined, and the sources and causes of different parent styles are addressed in detail. 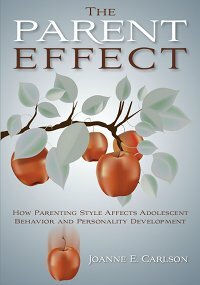 Each chapter then delves into various teen reactions (both positive and negative) and provides a description of the impact on the teens’ personality. Included in The Parent Effect are suggestions and exercises that provide for personal assessment and change in parenting style. This section addresses those issues in parents’ lives that shape interaction with their teenagers.